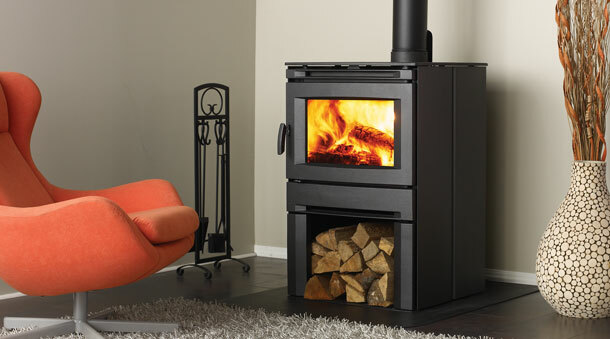 The Alterra CS1200 wood stove puts the focus on the brightly burning wood fire. Contemporary styling with a 20% larger glass front than traditional stoves provides the look you want. The handy wood storage area down below adds to the visual appeal and functional convenience. With an output of 55,000 BTU, the ability to take 18" logs and a burn time of up to 8 hours, the CS1200 has an efficiency rating of 77.7%. This stovve is suitable for a room size of 1200 sq. ft.
Width 27.125" Height 37.8125" Depth 21.75"
Using the same contemporary styling as it's smaller cousin, the Alterra CS2400 features a large viewing area so that the fire is front and center. Lower level wood storage presents and interesting textural contrast to the sharp, smooth black lines of this stove. Maximum BTU is 75,000. It will take logs up to 18" long. Burn time clocks in at up to 8 hours. 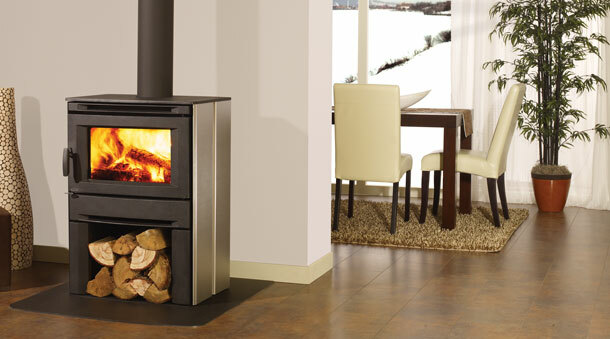 This wood heater will handle the needs of rooms from 1,000 to 2,200 sq. ft.
Width 26.375" Height 39.125" Depth 28.875"
For more information on Regency wood stoves, go here.